ESS Mobil Tool Kaddie Spill KitESS Mobil Tool Kaddie Spill Kit,Wheeled so you can take spill clean up supplies right to the spill. Easily fits through narrow aisles and doorways. Packed with everything you need for quick response. 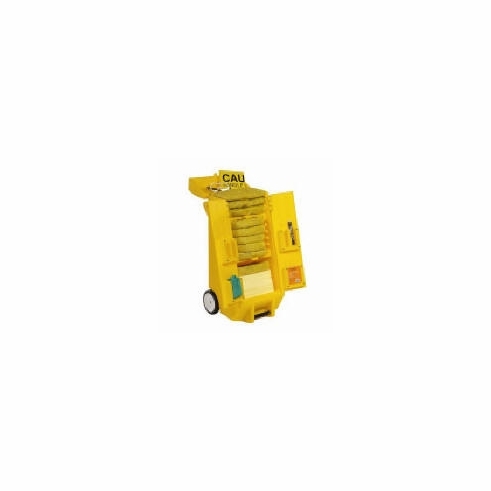 ESS Mobile Tool Kaddie Spill Kit is a great response cart for small to medium spills. Very convenient. Wheeled so you can take spill clean up supplies right to the spill. Easily fits through narrow aisles and doorways. Packed with everything you need for quick response. The kaddie spill kit is available with either universal, oil only or hazmat absorbents. Contains safety items such as goggles and gloves. Epoxy putty for emergency patching of a leak and a glow light stick if the power is out is also included. The easy view compartments keep supplies organized and at hand. You can easily see which items are used/missing so you can replace them so you are not left stranded when another spill occurs. The caddie spill kit is lockable for added safety. This durable heavy duty wheeled cart will last for many years. Just purchase low cost refill kits when the contents of the cart is used - saving money over the long term.